'Beresheet' performs critical maneuver into orbit around the moon in preparation for landing on lunar surface. 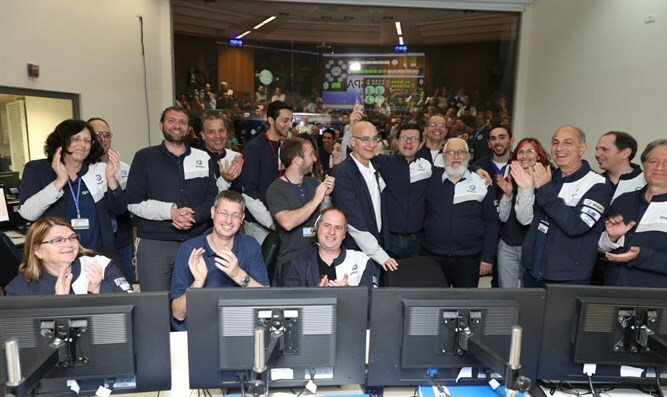 SpaceIL’s engineering team and Israel Aerospace Industries (IAI) this evening at 5:17 p.m. Israel team conducted the most critical manveuver to date of Beresheet’s journey to the moon – the Lunar Capture. This maneuver enabled the spacecraft to be captured by the moon’s gravity and begin orbiting the moon – and with the moon, orbiting the Earth. Landing a spacecraft on the moon will represent an extraordinary achievement for the small state of Israel. The project demonstrates Israel's technological capabilities and opens many opportunities. They include promoting scientific education of the next generation: Since its founding, the NGO met with over one million students throughout the country. Secondly, the mission will advance and promote science and research. Finally, it would open a new horizon for the Israeli economy, thanks to its engineering knowledge and advanced development capabilities. The success of Beresheet is a symbol of Israel's success in these and other fields. Once landed on the moon, the spacecraft carrying the Israeli flag will begin taking photographs of the landing site and a selfie to prove Israel landed on the moon. The spacecraft has an important scientific mission to complete: to measure the moon's magnetic field as part of an experiment carried out in collaboration with the Weizmann Institute of Science in Israel. NASA is also participating in the mission under an agreement entered with the Israel Space Agency. NASA has installed a laser retro-reflector on the spacecraft and will assist in communicating the spacecraft on the moon. The spacecraft carries a time capsule -- a huge database of hundreds of digital files ranging from details about the NGO, the spacecraft and the crew of the project, national symbols, cultural items and materials collected from the general public over the years that Beresheet will place on the moon. The time capsule will remain on the moon even after the mission is completed. Since the spacecraft is not expected to return to Earth, the information it carries is destined to remain on the moon for an indefinite period and may be found and distributed by future generations. In January 2019, the spacecraft was packed and flown to the U.S. launch site in a complex logistics operation. Beresheet was flown in a unique container, which underwent structural and engineering changes to accommodate the sensitive cargo. After arriving at Ben-Gurion Airport in Tel Aviv, it was loaded onto a temperature-controlled cargo plane. Upon landing in Orlando, Florida, the spacecraft was transported by land to the launch site. IAI has been a full partner in the project since its inception. Over the years, additional partners have been added from the private sector, government and academia. The most prominent of them are the Weizmann Institute of Science, the Israeli Space Agency, the Ministry of Science and Technology, the Israeli telecommunications firm Bezeq and others. Among the main contributors to the project are Dr. Miriam and Sheldon Adelson, Sammy Sagol, Lynn Schusterman, Sylvan Adams, Stephen Grand and others. Philanthropist and businessman Morris Kahn took the lead in completing the mission by funding $40 million of the project, and in his role as president of SpaceIL.